Singapore's Toh Kai Wei (right) attempts a pass with Sri Lanka's GD Chathurangi Jayasooriya jumping in to block. Singapore's GK Chen Lili and Sri Lanka's GS Tharjini Sivalingam j ostle for a loose ball during the final, which Sri Lanka won 69-50. 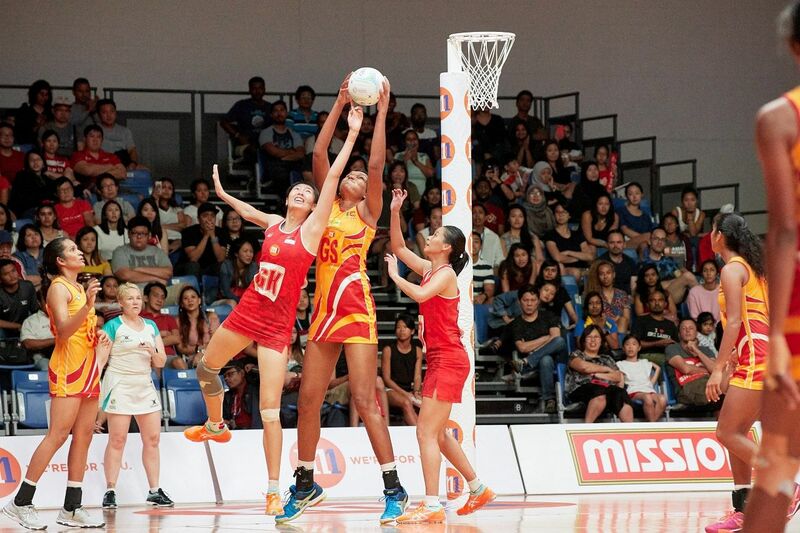 SINGAPORE - A rampant Sri Lanka outplayed Singapore 69-50 on Sunday (Sept 9) in the final of the M1 Asian Netball Championship at the OCBC Arena to win their first Asian title since 2009. The young Sri Lankan side showed that they had the depth to complement their 2.08m goal-shooter Tharjini Sivalingam with three other players in the starting XI standing over 1.8m. "I'm so proud of my team now and I'm very happy," said a jubilant Sri Lankan captain Chaturangi Jayasooriya after the game as her team-mates waved back joyously and blew air kisses. "Without all of you, I would not be able to achieve this goal (as captain). I would like to thank our coaches as well, and of course the Sri Lankan fans here today." The two teams were tied at 16-16 after the first quarter with goal-attack Charmaine Soh and goal-shooter S ivalingam in fine fettle for Singapore and Sri Lanka respectively. But, with the game finely balanced, it was Singapore who blinked first. Momentum appeared to have swung the way of the hosts at 20-18 with 12 minutes left in the first half when goal-shooter Lee Pei Shan had the opportunity from point-blank range to put Singapore up by three after Sri Lanka had botched a pass to Sivalingam at the other end. But Lee, 18, missed to let the opponents off the hook as Sri Lanka regrouped to score seven unanswered goals and take a 26-21 half-time lead. It was a lead they never relinquished as Singapore struggled against S ivalingam on one end, and 1.83m Jayasooriya and 1.86m Gayani Dissanayake (the goal-defence and goal- keeper) at the other. In an earlier match, Malaysia had beaten Hong Kong 52-46 to claim third place. As the top two teams, Singapore and Sri Lanka have automatically qualified for the 2019 Netball World Cup in Liverpool, England. Read the latest ST Specials and Supplements right here! We have been exp eriencing some problems with subscriber log-ins and apologise for the inconvenience caused. Until we resolve the issues, subscribers need not log in to access ST Digital articles. But a log-in is still required for our PDFs.